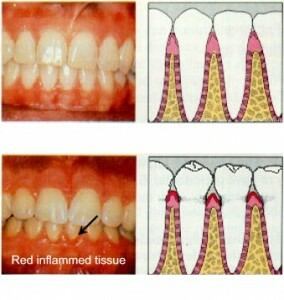 A major cause of tooth loss in adults is periodontal disease. The term gum disease or periodontal disease includes both gingivitis and periodontitis, and it affects the periodontium which consists of the tissue that surrounds and supports the teeth. However with early detection and treatment of the disease, it is now possible for most people to keep their teeth for a lifetime. Chronic gingivitis is, with few exceptions, the beginning stage to the development of chronic periodontitis, but clinically, the line between chronic gingivitis and the onset of periodontitis cannot be clearly drawn. Nevertheless, one important difference is that chronic gingivitis can generally be cured by plaque control. On the other hand, the effects of chronic periodontitis that include loss of bone and tooth support are largely irreversible. With good oral hygiene practices, a plaque-induced gingivitis of bacterial origin can be cured with gum tissues returning to normal but on the other hand, it is usually not possible for the affected tissues to return to normal in periodontitis. Therefore it is important to recognize the early signs and symptoms of gingivitis and/or periodontitis and begin immediate treatment to arrest and control the progression of the disease. 1. The initial phase whereby the aim is to control or eliminate gingivitis and arrest any further progression of periodontal disease. Removal of plaque and any other factors that contribute to gingivitis is done by maintaining good oral hygiene. This effort can be done by proper toothbrushing that do no harm to the tooth or gums. Brushing alone is unlikely to clean the small spaces between the teeth therefore use of floss and interdental brushes can help enhance the cleaning of the mouth. 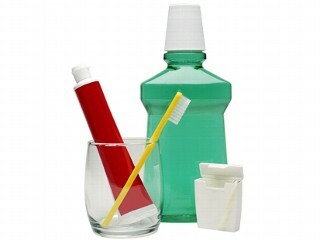 Mouthwashes like over-the-counter products with essential oils, such as Listerine, or dentist prescribed chlorhexidine mouthrinses may help in keeping our mouths clean but it is important to remember that effective plaque removal is done by mechanical cleaning and not only by the use of mouthwashes themselves. 2. The corrective phase aims to restore function to the tissues and correcting any faulty fillings or appliances that retain plaque. Professional tooth cleaning or scaling can remove stubborn tartar or plaque in hard to reach places in the mouth. 3. The maintenance phase aims to keep our mouth in healthy condition after any correction is done by practising good oral hygiene instructions and having frequent visits to the dentist. This entry was posted in Gingivitis and tagged bleeding gums, gingivitis, gingivitis causes, gingivitis symptoms, gingivitis treatment, Gum Disease, how to treat gingivitis, is gingivitis curable, Periodontitis, what is gingivitis on September 17, 2010 by oileng.